A Pathfinder Society Scenario designed for levels 3-7 (subtiers 3-4 and 6-7). When the Pathfinder Society claimed the Hao Jin Tapestry in Tian Xia, it seemed as though the Aspis Consortium’s influence there had ended. An anonymous informant recently identified an Aspis resurgence in Goka’s Deepmarket, and Venture-Captain Amara Li hopes that a small, well-trained team can ferret out the villains and prevent any greater atrocities. Can the PCs traverse the Deepmarket’s treacherous politics and tunnels and neutralize the Consortium’s local ringleader? 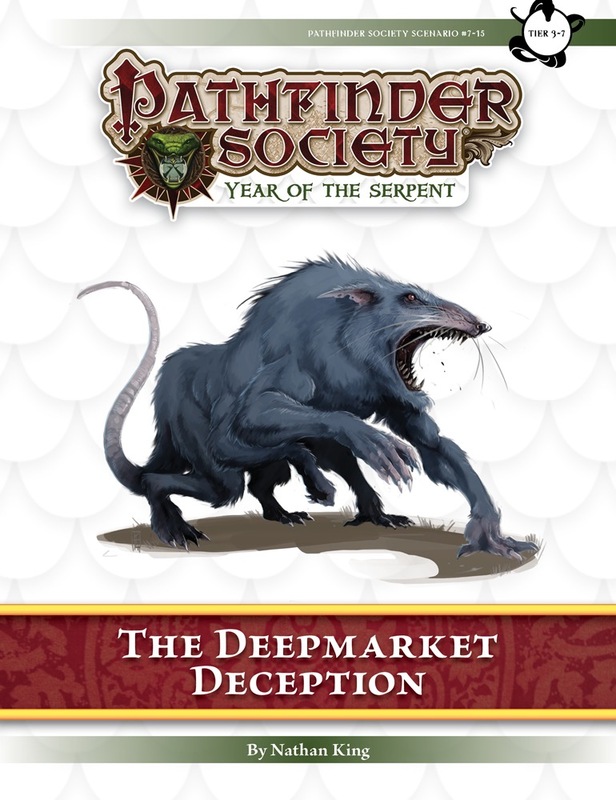 Content in “The Deepmarket Deception” also contributes directly to the ongoing storyline of the retired Lantern Lodge faction. Content in this scenario also ties into a special metaplot element from Pathfinder Society Special #6–98: “Serpents Rise”. Players who have completed that special event are encouraged to bring its Chronicle Sheet when playing this adventure. My Serprents Rise PC is lower subtier. 3rd level Ranger. Mine is 6th level, but I wasn’t thinking of bringing him along anyway. I have a few 3rd level characters I can choose from. I’d like to bring along my 3rd level Ifrit Bard (Flamedancer). I can get the files to you soon, BF. So I just got my email and it says something about team speak. Discord is better and is what I have. Must it be team speak? We will be using Teamspeak as the voice server for this game. I’ll double check to see if you need to bring your actual Serpent’s Rise character to the event for the perk.. I seem to remember that .. well let me check and get back. Please post some basic character info and levels to help players coordinate their plans. OK, this looks like subtier 3-4, so I will try to bring something in that range. Probably a ranger, since that’s my PC that has the Serpents Rise credit. How are we looking on characters? So far I see a Ranger/3 and Bard/3. Do we need more muscle? I have a Barbarian/3 if necessary, but I’d have to look him over to make sure he’s cleaned up (and BF would hate the last minute submission.